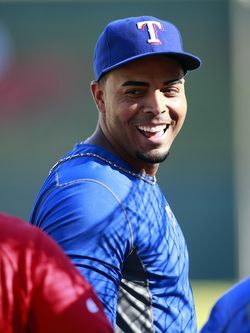 Nelson Cruz was on his way to perhaps the finest offensive season of his career until his connection to the Biogenesis PED scandal resulted in a 50-game suspension that effectively ended his regular season (he did play in the Game 163 tiebreaker against the Rays). While he's served his punishment and isn't at risk of further suspension in 2014, he'll still be somewhat of an uncertainty on the free agent market. Right-handed power is in short supply, and Cruz has it in spades. He didn't have enough plate appearances to qualify for the batting title this season, but among free agents with at least 200 plate appearances, Cruz's .240 isolated power (slugging percentage minus batting average) trails only Raul Ibanez's .244. Mike Napoli is often cited as the best source of right-handed pop on the free agent market, but Cruz belongs in the conversation right alongside his former teammate. Cruz's 27 homers in 2013 are tied with Robinson Cano for second among free agents despite the fact that Cruz totaled just 477 plate appearances this season. Cruz hit 80 homers from 2011-13 — good for fourth overall among free agents — despite ranking 30th in plate appearances among qualified free agent hitters in that time. Cruz has a platoon split for his career but still owns a lifetime .806 OPS against right-handed pitching. In 2013, he actually hit right-handers slightly better than he hit lefties. He also was more effective on the road this season, showing that he has the ability to produce outside of Rangers Ballpark. This season may have shown that he's capable of hitting on the road, but Cruz's .734 career road OPS is dwarfed by his .912 mark at home. Like many hitters before him, he's thrived at Rangers Ballpark, slashing .294/.356/.555 in 1,589 plate appearances. That .911 OPS in Arlington is 87 points higher than his career mark. Walks have never been a strong point for Cruz. His 7.6 percent walk rate from 2012-13 is a near mirror image of his 7.9 percent career clip. Coupled with a rising strikeout rate (23.9 percent in 2013) and a 12.5 percent swinging-strike rate (9.3 was league average in 2013), it's safe to say that plate discipline is not an area in which Cruz excels. It can be argued that a great deal of the value Cruz provides at the plate is given back by shaky work in the outfield. Speed used to be one of Cruz's assets earlier in his career (37 stolen bases and +3.6 runs on the basepaths from 2009-10, per Fangraphs), but his defensive ratings have plummeted with his stolen base totals. Cruz has cost his team between 14 and 21 runs from 2011-13, per Ultimate Zone Rating and The Fielding Bible, respectively. There's likely some correlation between the decline in speed and defensive skills and the four separate DL stints Cruz has had for hamstring-related injuries since 2010. Cruz was suspended 50 games this season and accepted full responsibiity for his mistake in an interview with reporters, including Mike DiGiovanna of the L.A. Times. Cruz said that he was diagnosed with helicobacter pylori, resulting in a weight loss of nearly 40 pounds, prior to the 2012 season: "Just weeks before I was to report to Spring Training in 2012, I was unsure whether I would be physically able to play. Faced with this situation, I made an error in judgment that I deeply regret, and I accept full responsibility for that error." The Rangers made a qualifying offer to Cruz, meaning he'll be tied to draft pick compensation.The thought of sacrificing a first- or secound-round pick for a 33-year-old outfielder with a slipping defensive reputation is likely somewhat of a deterrent to teams that may show interest. Cruz is an accomplished two-sport athlete, having played basketball for the Dominican Republic Junior National Team earlier in life. His father played professional baseball in the Dominican Republic, so athleticism is clearly in his genes. He's done quite a bit of charity work, including recent donations to aid in the purchase of fire trucks and ambulances in the city of Las Matas Santa Cruz near his hometown in the Dominican Republic. Cruz and his wife have two children. Cruz has always been well-liked and well-regarded in the clubhouse, and the Rangers clearly didn't sour on him even after his 50-game suspension. He was welcomed back to the team, and manager Ron Washington offered high praise for Cruz: "When you think about a Nelson Cruz, who wouldn't want a Nelson Cruz? Big heart, great teammate." Within that same article, Washington voiced a strong desire for Cruz to return in 2014. A midseason acquisition of Alex Rios likely means the Rangers are set in right field; unlike Cruz, Rios is a defensive asset in right. However, the Rangers still have a need in left field and at DH, so a new contract for Cruz could definitely be in the cards. Outside of the Rangers, the Royals have a clear hole in right field and no prospects to fill it following the trade of Wil Myers. The Pirates could also use a right field upgrade as well after posting a wRC+ of just 99 that was boosted largely by the efforts of the departing Marlon Byrd. The Phillies are known to be looking for a right-handed bat after GM Ruben Amaro Jr. said he doesn't consider Darin Ruf an everyday player, and the Rockies could also look to install Cruz in right field and transition Michael Cuddyer to first base. MLBTR's Zach Links pointed out the slight irony of the D-Backs' need for a power-hitting outfielder recently, and Cruz could fit the bill for them as well. The Mariners, Yankees, Orioles, Mets and Giants, each with corner outfield/DH vacancies and a need for more offense, strike me as fits as well. Cruz's admitted PED usage was prior to the 2012 season, so while some may question the validity of his monstrous 2013 numbers, it doesn't appear that there's any PED link to this year's performance. Cruz has always shown plus power, and power pays handsomely on the open market. He may be below average defensively, but he's far from the worst outfielder in the league. He should have no problem landing a multiyear deal. Cruz is among the best right-handed power bats on the market along with Napoli, who Tim Dierkes projected to receive three years and $42MM. Hunter Pence received a five-year, $90MM contract from the Giants, but he's three years younger, a better defender and that was top of the market value. I imagine that agent Adam Katz of the Wasserman Media Group will seek a four-year deal. Given his age, questionable defense and Biogenesis connection, I'm skeptical that four guaranteed years is realistic, though I won't be completely shocked if it happens. Ultimately, as a reliable source of 25 home runs (at least) from the right side of the dish, my expectation is that Cruz can overcome any perceived warts to find a three-year, $39MM contract. Well, he has beaten my Tigers single handedly several times, or so it seems.